Original Editor - Adrian Mallows. 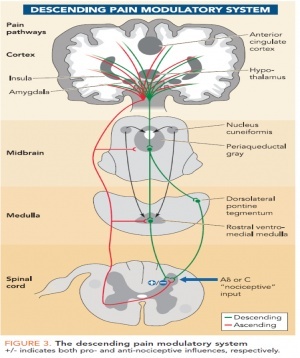 1 What is the descending pain modulatory system? 2 Why is the system useful? 3 How can this help physiotherapists? What is the descending pain modulatory system? The "top down" modulation of pain has been in evidence since the early work of Sherrington showing that nociceptive reflexes were enhanced after transection of the spinal cord. This was further elaborated on by Fields and Milan who, based upon observations in the 1960's that electrical stimuation of the periaqueductal gray (PAG) area can produce analgesia, demostrated through electrophysiological and pharmacological studies that descending influences on spinal nociceptive processing involves the PAG and the rostral ventromedial medulla (RVM). Work by Hadjipavlou et al used functional and anatomical studies to link the descending pain modulatory system from the brain stem (where the PAG and RVM reside) to a number of higher level brain areas including; cingulofrontal regions, the amygdalae and the hypothalamus (figure 3). This may go someway to help explain the role that emotions and cognition have in processing nociceptive information. Underpinning the descending pain modulatory system is the endogenous opoid system and according to Willer this system may be activated by a variety of reflex and cognitively trigged states. At the spinal cord (dorsal horn) level, the opiod system causes inhibition of substance P from peripheral noxious mechanical stimulation via release of noradrenaline from the dorsalateral PAG (dPAG) and thermal nociceptive stimuli via the release of serotonin from the ventrolateral PAG (vPAG). Why is the system useful? Evidence for pain modulalatory mechanisms were first recorded by Beecher. Beecher, a physician serving the US Army during World War II, observed as many as three quarters of badly wounded soldiers reported none to only moderate pain and did not require pain relief medication. According to his report the men were alert and responsive and the injuries were not trivial, including compound fractures and penetrating wounds. This led him to the conclusion that "strong emotions" block pain. This clearly opposess the classical Cartesian view where pain was considered to be a hard-wired system that passively transmitted noxious inputs to the brain. It is now generally accepted that the experience of pain does not soley rely on noxious inputs, but many variables interplay with the experience, including memory, mood, environment, attention and expectation. Ultimatley, this means the resultant pain experienced to the same sensory input can vary considerably. It is the brain's job to weigh all the information and decide whether creating pain is the most appropraite reponse. This provides a neccesary survival function since it allows the pain experience to be altered according to the situation rather than having pain always dominate. How can this help physiotherapists? Knowledge of the descending pain modulatory system and its components can help physiotherapists in several ways. Firstly, it helps physiotherapists explain why the amount of pain a patient is experiencing does not neccesarily relate to the amount of tissue damage they have sustained. Physiotherapists can educate their patients about the role of the descending pain modulatory system and how the central nervous sytem weighs all the information before deciding if a pain experience is the most approriate action for survival. Neuroscience education has been shown to be effective in several studies . Secondly, knowledge of the anatomy (see "what is the descending pain modulatory system" section) involved in the descending pain modulatory system can help physiotherapists utilise management strategies to that access and activate the system. These could include adding distractions to exercises and perfoming exercises in different emotional states and or in different environments. ↑ Sherrington CS. The Integrative Action of the Nervous System. New Haven, CT: Yale Univ. Press,1906. ↑ Louw A, Louw Q, Crous LCC. Preoperative Education for Lumbar Surgery for Radiculopathy. South African Journal of Physiotherapy. 2009;65(2):3-8.